Dr. James Willocks MD FRCOG FRCP was born in 1928 in East Kilbride, Scotland. Willocks, the son of an engineer, was educated at the Hutcheson's Grammar School, Glasgow, where he excelled in the classics, English and history. He graduated MB ChB from the University of Glasgow in 1951. After house officer postings at the Hairmyres Hospital, Lanarkshire, he worked several years in Malaysia until his return to the University Department of Obstetrics and Gynaecology at the Glasgow Royal Maternity Hospital (Rottenrow), working under Professor Professor Ian Donald. In his department, he was well-known for his enthusiasm at the use of the vacuum extractor ("ventouse") as an alternative to obstetric forceps. He qualified as Member of the Royal College of Obstetricians and Gynaecologists in 1958 and Fellow in 1969. He obtained the degree of Doctor of Medicine in 1963. Together with Donald, he started on ultrasonic A-mode cephalometry, or the measurement of the fetal skull bone biparietal diameter (BPD), using a modified metal flaw detector. Professor Ian Donald had not long ago pioneered the use of ultrasound in Obstetrics and Gynaecology. Tom Duggan, a key contributor to the instrumentations, fabricated an electronic curser on the oscilloscope display which produced a bright spot that could be set onto the sharp A- mode echo spikes obtained on the two sides of the biparietal diameter. The distance between the two dots could be read from the dial that moved the dots. Willocks produced the world's first papers on the BPD and its serial measurements and the cephalometric assessment of fetal growth. 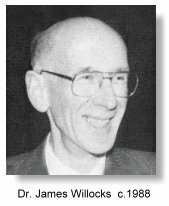 In 1963 he published his cephalometric data in his MD thesis. In 1964 he became lecturer in midwifery at the Queen Mother's Hospital (QMH) when it opened in in that year. In 1966 he was appointed NHS Consultant Obstetrician and Gynaecologist at the Queen Mother's Hospital and Western Infirmary. Stuart Campbell joined the QMH department in 1964 and was assigned to work under the supervision of Willocks. Campbell soon expanded cephalometry to the B-scan. James Willocks did not quite pursue further an academic career despite his achievements but stayed as a consultant in the more general areas of Obstetrics and Gynaecology (obviously with a special interest in ultrasound) at the Queen Mother's Hospital and Western Infirmary where he remained until his retirement in 1990. He has held various important appointments at the Royal College of Obstetricians and Gynaecologists throughout his career and was involved in the system of inquiry into maternal deaths. Willocks was known for his particular interest in historical accounts in medicine and in 1966 he published "William Smellie and the Birth of Modern Obstetrics". Another of his historical articles was "The Glasgow Royal Maternity Hospital 1834-1984 -- 150 years of service in a changing obstetric world" which he wrote in 1985. He was also well-known for his historical accounts of Professor Donald and the early days of the development in Glasgow. Indeed he was frequently invited to lecture and author on this subject. Two splendid accounts of such can be found in the University of Glasgow publication 'Avenue' No. 19: January 1996 entitled 'Medical Ultrasound -- A Glasgow Development which Swept the World', and "Ian Donald and the birth of Obstetric ultrasound" -- in the book: "Obstetric Ultrasound 1", edited by James P. Neilson and S.E. Chambers, Oxford University Press, 1993. Willocks is author of a number of review articles and textbooks in the practice of ultrasound and Obstetrics and Gynaecology, and on the use of epidural anaethesia (with anaesthetist colleague Donald Moir). One of his more important textbooks was "Essentials of obstetrics and gynecology" (first published in 1982), which ran for 5 editions. Willocks was also well-known as an outstanding public speaker. He was always scholarly, eloquent and yet at most times entertaining. His wit and sense of humour endeared him to his audience, colleagues and patients alike. He was diagnosed in August 2003 with motor neurone disease, which had progressed rapidly. He walked through it with much dignity and courage. James Willocks passed away in Glasgow on 13th February 2004. Willocks last book " Ian Donald - A Memoir, co-authored with Dr. Wallace Barr was published in June of the same year. Image courtesy of the British Medical Ultrasound Society.